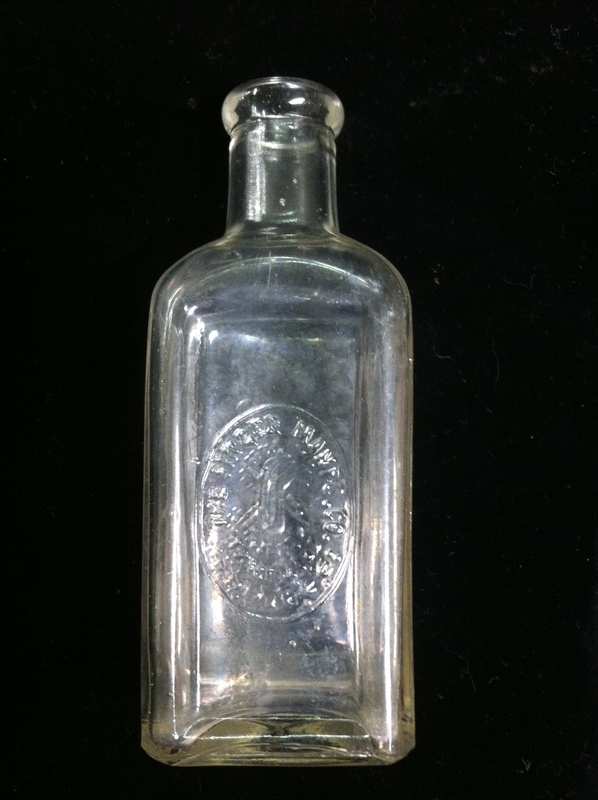 Bottle embossed “THE SINGER MANFG CO. TRADE MARK”. The bottle was for sewing machine oil. The Singer Sewing Machine was invented by Isaac Merrit Singer, an American. According to Encyclopædia Britannica, “He developed and brought into general use the first practical domestic sewing machine. At the age of 19 Singer became an apprentice machinist, and in 1839 he patented a rock-drilling machine. Ten years later he patented a metal- and wood-carving machine. While working in a Boston machine shop in 1851, Singer was asked to repair a Lerow and Blodgett sewing machine; 11 days later he had designed and built an improved model, which he patented and sold through I.M. Singer & Company. The first to embody features allowing continuous and curved stitching, his machine employed an overhanging arm holding the needle bar over a horizontal table, thus making it possible to sew on any part of the work. His basic design features have been followed in almost all subsequent machines. PBS’s series Who Made America notes “Importantly, [Singer’s] new design caused less thread breakage with the innovation of an arm-like apparatus that extended over the worktable, holding the needle at its end. It was the first practical replacement for hand-sewing, and it could sew 900 stitches per minute, a dramatic improvement over an accomplished seamstress’s rate of 40 stitches a minute on simple work. While the first Singer machines were relatively expensive and bulky, the inventor soon adopted a mass-production system of interchangeable parts, and worked to reduce the machines in size and weight. From the start, he looked past the commercial market into households, aiming to sell to housewives. After a series of refinements, Singer was able to sell his machines for $10 each, making them accessible symbols of status and self-reliance for the average American family. His partner, Edward Clark, pioneered installment purchasing plans and accepted trade-ins, causing sales to soar. Author Richard Cavendish adds that “Lady demonstrators were hired to disprove suggestions that women were too fluffy and incompetent to work a machine and Singer’s hire-purchase deals caused Scientific American to reflect in the 1850s on the curious psychological fact that customers preferred to pay $100 in monthly instalments of $5 rather than $50 outright, even though they had the money. In New York, Singer liked to drive about in a grandiose vehicle of his own design, painted canary yellow and black, drawn by six or sometimes nine horses, with a small band playing on board. It had seats for thirty-one people, beds for the children and a water-closet. His attitude to women could be conservatively described as enthusiastic. He married for the first time at twenty-nine and after a few years left his wife and their two children for a mistress with whom he had ten more. Later he set up two more households with women by whom he had respectively one child and five. The company vigorously developed markets abroad and by 1860 it was the world’s biggest producer of sewing machines, but rows between his women folk and the prurient attentions of the press became so tiresome that Singer took refuge in Europe, where in 1863 he married his second wife, a Parisian boarding-house keeper named Isabella Boyer, by whom he would have six more children. In his early fifties, he settled in England and built Oldway House at Paignton in South Devon in majestic French Renaissance style for himself and some of his brood of twenty-four offspring – he was very fond of them all. He had always wanted to be an actor and he had his own private theatre in the house, which he called The Wigwam. He died there in 1875, aged sixty-three. French Singer Sewing Machine Ad, date unknown. Singer Sewing Machine Shop advertising sign. Date unknown. Ad for Singer Sewing machines, date unknown. Singer Sewing Machine Ad, date unknown. I have a Singer that Says “The Singer Manufacturing Company, Made in Canada and the seral @ is JO460121 OR J0460121 and I cannot find this serial number anywhere to find out when the machine was made. Can you help me?